We all know that one person who loves only one thing more than chocolate and that is: more chocolate! 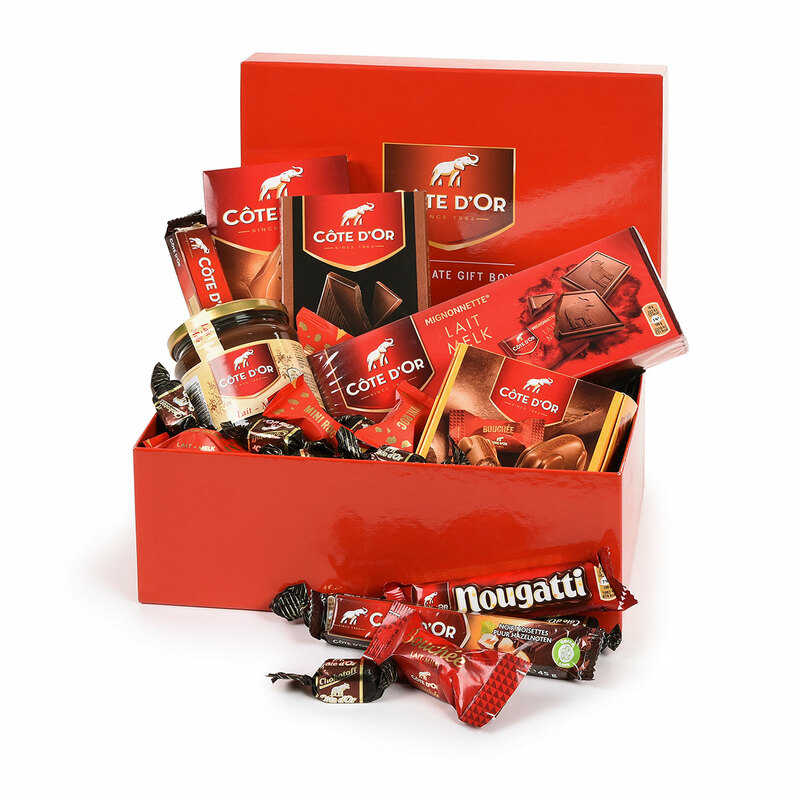 What better gift to surprise that chocolate loving person with than this beautiful Côte D'or Lover Box? Your favorite chocoholic won't believe his eyes when he opens this fan-tas-tic gift box filled with heavenly Côte d'Or chocolate treats. The Mignonettes are a true classic: small milk chocolate tablets that are perfect to share at the office or at home with your family and the ultimate treat to serve with a cup of coffee. Both the Mignonettes and the Milk Chocolate spread are a true delight to enjoy on sandwich. Soft and at the same time bursting with flavor. Enjoy the two seductive chocolate tablets: discover the power of Côte d'Or chocolate with the crunchiness of whole hazelnuts and the unique combination of chocolate with red fruits. Our delicious gift box is complemented by a whole range of chocolate snacks: a chocolate bar, a Nougatti bar, incredibly soft bouchées of white and milk chocolate with praliné filling, pralinettes - milk chocolate pralines with praliné filling and a crispy wafer - and the delightful Chokotoffs: caramel sweets with chocolate, for an extra long lasting Côte d'Or chocolate treat.